We roll out of August into Labor Day weekend without much thought about how significant the month of September really is to our business and the business cycle of those around us. September is a pivotal time in the business cycle because we have a big shift in perspective as to where we are in relationship to where we want to be for the year. Let me share with you a few observations that many professionals fail to recognize. When we conclude the month of June, we all acknowledge that we are half way through the calendar year. No big deal, just half way along with plenty of time to get all the things accomplished that we had planned. Some people review their position at the half way mark, but most don’t. We recognize the time, but rarely do we confirm our position in relationship to our plan. Remember that business plan we wrote at the end of last year? Have you been reviewing it on a regular basis? Chances are, you will have trouble finding it, not to mention having any idea where you are EXACTLY in relationship to your projections. But no worries, it’s just June, plenty of time to get everything done we had planned to do. Well, then we go through July and August. Sixty-two days of fun and frolic. Vacations and other areas of interest consume our time and as we approach Labor Day we find ourselves now two-thirds of the way through the year. Still not a big issue for many people, in their minds thinking that two-thirds is just a bit more than half way and nothing to worry about. Then it happens; September! Thirty quick days and we go from summer to fall and more importantly, from two-thirds to three-quarters of the year now behind us! The reality hits, “how did the whole year get past me?” For mortgage and real estate professionals this reality is even more of an urgent matter. In our business, transactions must close by December 31st to count in our numbers, so what is the lead-time to make that happen? For mortgage professionals, it is likely that you would need to have an application in your possession by Thanksgiving in order to be sure you closed before the end of the year. For a buyer’s agent, you would likely also need to have your contract signed by Thanksgiving for that deal to close by the end of the year. But for that listing agent, when would you need to have an appointment set to speak to a prospect in order to get the house ready to be listed and to begin showing that property, in order to get an offer, negotiate the transaction, deal with the inspections, in order to get that house closed by the end of the year? You see, it’s later than you think. September quickly compresses the calendar for us because not only do we go from two-thirds to three-quarters of the year being over, we change the discussion from vacations and back to school, to the end of the year and the question: “Do you really want to spend this coming winter in this house?” If that answer is NO, then you are almost out of time to get that done! We need to talk with our referral partners, ALL OF THEM; to be very clear how little time is left to get the things done that need to be done. If anyone needs to buy, sell, refinance, or make choices about their investments and taxes, the time to get that moving is NOW! 2013 saw changes in the tax code that can really change the way people look at their money and their income. As we speak, a large number of people still haven’t filed their taxes for 2012 yet (The six month extension takes them into the middle of October), and here we are talking about planning for what we are going to do before 2014 gets here. Stores are already putting up Christmas decorations. My wife is likely half done with her shopping already! The point is we have an opportunity to share information and create awareness. We have the ability to get out and share important information and engage our referral partners with specific actions they can take right now to increase their awareness and improve their opportunities to complete the year the way they had planned. So enjoy the Labor Day weekend. Have a great time. Just remember that we leave summer into fall, but for our industry, this year is going to end sooner than you think! What are you going to do to be sure you reach your goals and beyond? Questions or comments please email: mike@imtcoaching.com and please “Like” us on Facebook® and connect with me on LinkedIn®. What to do with the numbers! We had a whole bunch of numbers released by the Mortgage Bankers Association for the month of July. Let’s look at them and see how we can use this information to our advantage. First I want to share a chart that my friend Rick Mount of Fairway Mortgage in San Dimas California found that I think shares a very good point. From a historic point of view, interest rates are really very attractive. If you look at the rates during the peak purchase years of 2004 – 2006, rates were significantly higher than today! 30 year fixed rates remain a great deal. Yes they are not as low as they once were, but just look back over the years and see what rates have looked like for a majority of our lifetime? Weren’t people buying homes? 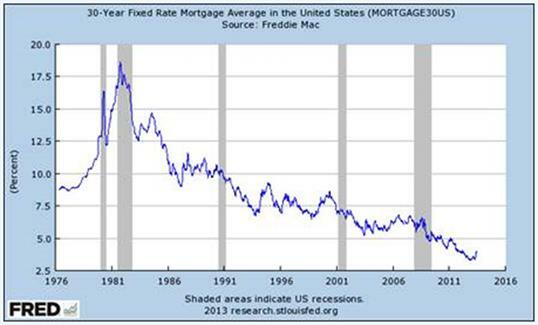 Just because rates are not as low as they once were, does not mean they still are not very attractive! So share the information with your people and your referral partners. The news is not bad, the news is GREAT! Yes, refinance business continues to fall. Now down a total of 62% since the peak, but we all knew refinances were going to fall from their high levels at some point, and that process has begun. As they get closer to a much more “normal” level, they will still be a part of our business, but just a smaller portion of the total. What we have to focus on are purchase loan applications. As purchase activity continues to rise, we will also find that “new normal” of purchase business. Here are some important numbers. Existing home sales are up 6.5% in July and up 13.7% year over year. While not enough to replace all the refinance volume we have lost, this is the highest level since November of 2009! While home inventories remain tight, there ARE homes being listed and sold every day. Now we are facing a very important Federal Reserve meeting next month and we are likely going to see a shift in policy. That shift will likely contain what people have been calling “tapering” of the amount of money the Federal Reserve uses to buy MBS and Treasuries. Since this approximately $85 Billion dollars a month will certainly be reduced, it is not all going to disappear all at once and likely be done over a pretty long time frame. It is also important to say that the Federal Reserve will continue to reinvest all the principle payments and payoffs it receives so it will still be a big number, but just not quite as big. To be honest, I think much of this is already priced into the market. While we will continue to see volatility, I don’t see a huge jump in rates after the September 18th meeting. This is just my opinion here. People will continue to buy houses. In fact, as interest rates rise, that should actually help the total number of purchase loan transactions as it will become less attractive for investors to invest cash into these properties and slowly begin to drive the number of all cash deals down. We need to work with our Realtor® referral partners using our “Forever Home Strategy” to help generate new listing opportunities. We must share important information with the public so people can see that now is still a great time to sell their home and buy a new one, or to get pre-approved to buy their first home. We all need to stop thinking we are salespeople and realize we are solutions providers. We don’t sell mortgages, we help provide them for people who wish to buy a home and finance a portion of that purchase over time. We don’t ask agents for business, we work with our Realtor referral partners to generate opportunities! Look at the numbers. Go to the MBA website and read the information for yourself. Look at the chart and see for yourself where historic rates have been. Use these tools to share information and provide solutions to those people who will benefit from having this knowledge and use it to make an informed choice about where they live, how they live, and what they have to pay to live there! Posted on August 22, 2013 Categories coach mike white, loan coaching, loan originations, loan originator, mortgage banker, mortgage coachTags bank coach, bank loans, Bank Mortgage, coach michael white, coach mike white, improve my tomorrow, improve my tomorrow coaching, lender coaching, loan coach, loan orgination, loan origination coach, loan origination coaching, loan originators, michael f. white, michael white, mortgage banker, mortgage coach, mortgage coaching, mortgage mentor, mortgage originators, mortgage training, real estateLeave a comment on What to do with the numbers! It’s the middle of August and from all sections of the country loan originators are reporting a lull in their business. Some are concerned, others have their thoughts about why, and I myself needed to take a good look and offer my opinion as to what we are seeing and what may be in store for us in the short and long term. 1)It’s August and people vacation in August. 2)It’s time to get back to school. 3)The rapid rise in interest rates in June into July pulled some transactions out of August and September. 4)Some people stopped looking to see what was going to happen with rates. Vacations happen and August is as good a time as any. Buyers, sellers, Realtors®, and mortgage professionals have taken well deserved vacations. This happens every year, just one small part of the puzzle. Back to school is another drag on the buying process. It takes more time and energy than anyone thinks to get through this. Anyone with kids will tell you how much is involved. If you have changed schools or are just starting school; you are committed to this and not thinking about buying a house, at least not at this moment. The biggest factor I see is what I call the “pull forward effect”. The rapid rise in interest rates had people who would have likely bought homes in July and August, and closed on them in August and September. People accelerate those purchases because of the rising rate market. The fear of higher rates caused faster action making July and early August a great time for closings, but they also drained those shopping from the market and are causing a reduction in new purchase applications. The last group of people sat on the sidelines waiting to see if rates were going to drop back down as quickly as they went up. We all know that is not ever the way it works, but some people just had to see for themselves. So here we are in the middle of August. Vacations coming to an end, schools getting back in session, and those sitting on the sidelines are seeing that while rates have stopped climbing, they are not likely going back to three percent any time soon. Besides, who needs three percent rates to move houses? If low interest rates were the only reason homes were bought and sold, everyone would currently living in the house of their dreams! Since there are still homes on the market for sale, and still buyers out there looking, than the sole focus is not just rates! Historically we are still much closer to the bottom of the rate market than we are the top. While 5% is not 3.25%, it is not 10%, 12% or even higher. And yes, homes sold at those rates as well. We need to be students of history. We need to look at the market and understand the ebb and flow of conditions. Right now we are trying to discover the new normal. None of us know exactly what that is, but I am certain that home sales will continue to improve. Once we get past Labor Day and the Federal Reserve meeting on September 18th, the markets will have a much clearer picture of where we are going and people will resume buying and selling homes. How do I know this? It’s simple, we are still seeing inventories tight across the country, multiple offers are still frequent in some markets, and homes that are priced correctly are selling in days. With all of this going on, you would have to think that the demand will return and purchase transactions will take place, just as soon as we clear the lull. Housing is still a great deal. Owning is still cheaper than renting in many parts of the country. An overwhelming number of people in this country still believe in the American Dream of home ownership. People want to own where they live, and every day we need to remember that this is a great time to buy a home! One of the seemingly “minor” adjustments I make with my clients has always had a major impact on their loan opportunities from referral partners. It does not matter what kind of referral partner it is, this seemingly minor adjustment in their thinking and consequently their actions, often results in significant improvement in the number and quality of loan referrals by their referral partners. This adjustment just requires a little thought and some repetition to generate rewards. I call it “Thinking it through”. Here is what I mean. We all want Realtors® to refer us business but very few of us engage on explaining to them EXACTLY what we want. We leave to the Realtor® to make the choice if the person they are talking to wants or needs your help. When they do determine that they may need your help, most of them simply hand them your card and tell them to call you. This is good, but what if they don’t call? What if they needed your help and the Realtor® did not offer? The answer is, you lose opportunities and none of us can afford to lose any opportunity. 1) People who want to list their home for sale. 2) People who are thinking about buying a house. 3) People who rent and may benefit from owning. Here is the amazing part. Most loan originators now talk to their Realtor® referral partners about group #2. In fact, most Realtors® are only focused on referring a very small part of group #2. Statistics show that Realtors® only control about 30% of all purchase lead opportunities they encounter. That’s 30% of the buy side business they are engaged in, not 30% of the total potential buyers they get in front of. How many times does a Realtor® hand out your card and those people never call you? How many times does a Realtor® NOT hand out your card to someone who would have benefited from speaking with you? The numbers just grow bigger and bigger because we don’t do a very good job explaining to our Realtor® referral partners how and when to refer us, and what kind of information would be helpful to make that happen. Imagine if you could grow your referral opportunities from your Realtor® referral partner by double? Triple? What would your business look like? How would your life change if you saw five or ten opportunities each month from each of your Realtor® referral partners? What are going to do? Think it through! 1) Have your Realtors® hand your card to everyone they speak to, not just those that ask, and not just those looking to buy. Everyone is a potential target! 2) Don’t just “hand and hope”. In addition to giving out your business card, have them be proactive and provide you with the clients contact information so you can reach out to them. Realtors® are a great source of referrals. You just need to think the process through so you can maximize the number of opportunities you can receive. Many times it is just a matter of asking. You have to sit down and look at the opportunities that are there and share with Realtor® the way to move information back and forth. Hope is not a success strategy that works really well. You need to have a clear plan of what you want and have the ability to communicate with your Realtor® referral partner how and why doing this benefits them! What are the benefits? One powerful benefit is that now you will be following up with that person to help the Realtor® stay connected to that opportunity through their marketing efforts and yours as well! How many times a year would you need to bring a client “back” to the original Realtor® for that to have been a benefit? This is just a snapshot of what you can be doing with your Realtor® referral partners to improve the number of transaction opportunities for both of you. Much more can be done with this relationship if you just sit down and think it through! Same holds true for all your other referral partners. The only way to grow your business is to either increase the number of people referring you or to increase the number of referrals you get from each person. You need a plan that does BOTH! We closed out July and likely the bulk of the refinance boom closed with it. While there will certainly be opportunities to do refinances, we can’t be put in a position to rely on them for any more than ten or twenty percent of your total business from this point on. Now is a great time to check your numbers and compare your ratios of closed business. In some cases, the numbers may surprise you. Look at the entire year of 2012 and see what your balance of loans was purchase to refinance. Once you have those numbers, look at the first seven months of 2013 and do the same thing. If the ration of purchase transactions did not go up compared to 2012 total numbers, you have a reason to worry. If the total ratio of purchase loans improved, you have less to be concerned with. I have a few loan originators and managers who have done this math and were very surprised that the number of purchase transactions was much higher than they thought. These are the very same people who now realize that the lack of refinances will not destroy their productivity. In fact, when we compared their total numbers to the number of purchase transactions closing in their markets, we have found that the larger the focus on purchase transactions remained during the refinance boom, the larger the percentage of improvement in the number of purchase loans closed. Simply put, they are gaining market share at a higher rate than the market is growing! This is important information. As loan originators close out their pipelines of refinances and start to look at the purchase market, many originators that have remained committed to this business have already secured key relationships that provide them with referrals. We are also finding that these people are also securing new relationships as those people looking for professionals that know purchase business and have a history of closing loans on time and at the terms agreed to are coming into demand. Imagine that? Referral partners actually looking for the mortgage professional to bring business too? We need to shift our minds as to what the world looks like at seventy, eighty, or ninety percent purchase business. The reality is that this is what the future holds. After all, how many people do you think will want to refinance from 3.5% to 4.5% or higher? Some certainly will need too, but it is a tough sale without a compelling reason. August helps us take some time to focus on the new reality. We are already in a purchase dominant market. What are you going to do? How do your numbers look? How many purchase transactions have you done year to date and how does that translate for you over the balance of the year? You need to do your numbers and create a plan, the sooner the better. Many originators are having a good closing month in July. Some will cash their checks, take a vacation, and come back wondering what to do next. Now is the time for you to take action and get moving. Waiting until after Labor Day to try and “figure it all out” is going to cost you time and opportunity. Would you rather do this while your competition is on vacation, or when they come back ready for action? The choice is yours!